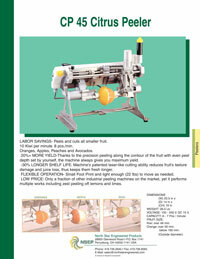 LABOR SAVINGS- Peels and cuts all smaller fruit. 10 Kiwi per minute. 8 pcs./min. Oranges, Apples, Peaches and Avocados. 20%+ MORE YIELD-Thanks to the precision peeling along the contour of the fruit with even peel depth set by yourself, the machine always gives you maximum yield. -30% LONGER SHELF LIFE: Machine's patented laser-like cutting ability reduces fruit's texture damage and juice loss, thus keeps them fresh longer. FLEXIBLE OPERATION- Small Foot Print and light enough (22 lbs) to move as needed. 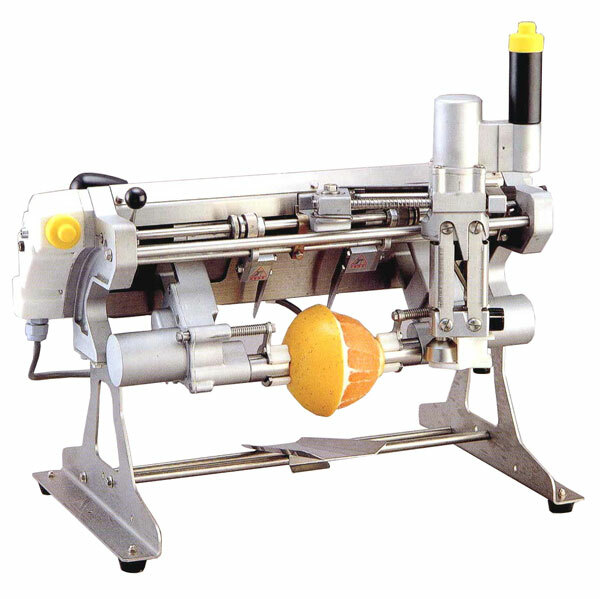 LOW PRICE: Only a fraction of other industrial peeling machines on the market, yet it performs multiple works including zest peeling off lemons and limes. Voltage 100-240 V. DC 15 V.
Fruit Size Kiwi: over 48 mm. Orange: over 50 mm. below 160 mm.